It’s been an interesting year for me. There’s been a lot of upheaval in my life, and in the life of my son. My husband and I recently had to share some disappointing news with our son. However, because my husband has a Ph.D. in Psychology, he realized that we should probably consult with a therapist ahead of time. Our child has had a lot to deal with recently, what with moving across the country and starting at a new school, and this is just one more thing. It’s tempting to be vague with your child in some cases in an attempt to protect him or her. However, many children understand enough to know that something is wrong — or that something is being kept from them. The age and maturity of your child will play a role in what information is appropriate for him or her to process. At the very least, you should prepare your child in advance and keep him or her in the loop. In our case, our son is old enough to understand what is happening, so we sat down together and provided an explanation. While the news isn’t exactly fun for my son, the reality is that now he feels in the loop, and he doesn’t feel like we are trying to keep important information from him. No one likes uncertainty, and no one likes to feel as though the people they trust most are keeping things from them. Let your child know what is going on, as much as is appropriate and understandable, and he or she will cope better. Next, your child needs to know that there is a plan. Children need structure and certainty, and that there is something to look forward to. This is where the plan comes in. Even if you don’t know all of the plan yourself, let your child know that there are some things that are certain. At the very least, let your child know that you love him or her and that the plan involves making sure that he or she is safe and cared for. Share what steps you can so that your child knows what to expect moving forward. We gave our son an overview of what the next steps in this life change will be, and it helped calm him down a little bit and see that there is purpose moving forward. There are many things in life that we can’t control. Your child knows this, especially since children are used to feeling as though someone makes all of the decisions. However, children do need to feel as though they are in control of something in their lives. They need to think that they matter and that they can make decisions. Find ways to include your child and provide some sense of control. We told our son that he can choose who he wants to talk to as we grow through this life upheaval. He can talk to us, to his friends, to his grandparents, or even to a mental health professional. We are leaving up to his choice to share as much or as little as he wants — with anyone he wants to share it with. On top of that, we are looking for other ways that he can make decisions and have a say. There are some things that he just can’t influence. But that doesn’t mean there is nothing for him to do at this time. Anytime there is a family decision to make, or a way for him to practically be involved, we make sure he has his say — and we make sure there are some decisions that he can make on his own to control some part of his destiny right now. 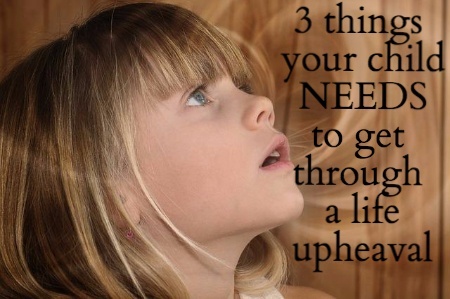 When you’re going through a life upheaval, you don’t always think of some of the simple ways that you can help your child cope. Make an effort to keep these in mind, and everyone will have a better chance at coming through it in a relatively healthy place.